Showing 1 - 1 of 1 Products for Air Mattress. WARNING CA Proposition 65 Message: Warning: This Product Can Expose You To Diisononyl Phthalate (dinp) Which Is Known To The State Of California To Cause Cancer And Birth Defects Or Other Reproductive Harm. A mattress tough enough for your truck! The Rightline Gear Full Size Truck Bed Air Mattress is made from heavy duty PVC with a comfortable flocked top surface. O-beam support ensures you will get a good night's sleep. The 12V air pump and easy inflate valve let you inflate or deflate the mattress in seconds. Best of all, the between the wheel wells design allows for gear storage between the mattress and the bed walls. You won't roll over on your stuff and your stuff won't roll over on you. 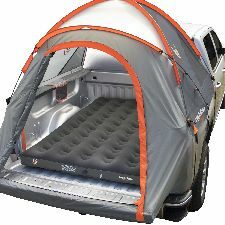 The Truck Bed Air Mattress folds up into a stuff sack for easy storage.